The protagonist of Michael Ende’s The Neverending Story is endowed with the ability to create and destroy the world of imagination as he sees fit. Is this the ultimate power? By Dr. Saul Andreetti. The Neverending Story1)Michael Ende, The Neverending Story. Translated by Raph Manheim. New York: Penguin, 1983. Henceforth NES is a novel by German fantasy writer Michael Ende. The novel, unlike the eponymous film released in 1984, eschews a simple-minded portrayal of fantasy themes, as it produces complex discourses on Being, Time and the nature of wishes and memory. One salient aspect of the novel foregrounds Power as a constant and recurrent element – where it is presented both in terms of destruction and creation – as Power entails the ability to create or destroy reality in its entirety. Further, Power is presented both as an object of desire, per se, something pursued by the Manipulators, and the werewolf Gmork, a worlds-traveller (Chapter IX) and as a means for the total control of reality; via the protagonist of the book, a child, endowed with the ability to create and destroy the world of imagination as he sees fit. Two examples of Ende’s treatment of power are the subject of the ensuing close-reading. First, the central theme of the novel, “the Way of Wishes” as the projection of one’s desires on to reality to the point of molding it. Second, and more acutely, chapter IX, where power is presented in terms of a manipulation of beliefs in the context of trespassing worlds and the destruction of the imagination. The novel presents a simple and linear frame narrative. It is the story of Bastian, a little boy who steals a book called ‘The Neverending Story’ from a bookshop. He starts reading the book in the attic of his school. He soon discovers that this book is not just a normal book but a portal into the dimension of the imaginative. Ultimately, he saves this world from destruction in the nick-of-time, by entering the book, and thus Fantastica, (Ende’s term for the world of myth and imagination), finally returning to his own world, transformed. Humans live by beliefs. And beliefs can be manipulated. The power to manipulate beliefs is the only thing that counts. That’s why I sided with the powerful and served them – because I wanted to share their power. As a result, the human world is flooded with Fantastican creatures, bereft of their true nature, lies in the human world. Likewise, humans have lost their ability to see Fantastican beings as they really are. Human disbelief in the existence of Fantastica dissuades them from trespassing the boundary between reality and imagination, and ultimately providing the Childlike Empress with a new name. This lack of a new name will eventually cause the demise of Fantastica. Fantastican creatures who lose their ontological status to become lies are “nameless servant[s] of power, with no will of their own.” Indeed, Ende constructs a discourse on Power by means of an appraisal of the imagination as a life-saving force. Humans’ impaired vision leads them to the mutual destruction of both Fantastica and the human world. The opposite is also true: if a human gives the Childlike Empress a new name, this will not only restore life and being to Fantastica, but it will result in the healing of the human world. Ende envisages the world as a place where poetry can be found in life itself3)Michael Ende declared this himself: „Denn danach suchen wir letzten Endes nur, die Poesie ins Leben zu verweben, im Leben selbst die Poesie zu finden.“ (to weave poetry in life, to find poetry in life itself “, translation is mine). This can be found in Ende’s publisher’s site, Thienemann: http://www.thienemann-esslinger.de/thienemann/autoren-illustratoren/michael-ende/biografie/, rather than an ordinary and dull existence where there is no place for mysteries and miracles. The second part of the novel presents us with a different scenario altogether. Bastian, now himself a part of the metadiegetic Neverending Story, is the Saviour of Fantastica; a moniker earned by giving the Childlike Empress the name of Moonchild. Through the power of AURYN, an amulet he wears around his neck, Bastian embarks on “the Way of Wishes;” according to which, he must find his true will. This can be achieved by “going the way of [his] wishes, from one to another, from first to last. It will take [him] to what he truly and really want[s].” AURYN can, in fact, grant Bastian all his wishes, which come true to the letter. The more Bastian wishes, the more Fantastica grows rich and varied. Bastian, however, can wish himself forward only at the cost of his memories. Paradoxically, Ende makes it clear that without memory one cannot wish because “without a past, you can’t have a future.” Now it is Bastian’s inner world that is in danger. With every single wish he is granted, he loses a piece of himself. The narrative, however, informs us that Bastian has another way to contribute to the growth of a new Fantastica, namely, by the act of creating from within imagination itself. Accordingly, Bastian makes up stories and names, and they also become true, to the letter. Such craving for a total control of reality shows the demise of another world: Bastian’s inner world. Bastian’s power over reality is the result of both his changes and his dependence on his wishes. Such neverending play with Bastian’s subjects, and their lives and destinies, is more than a solipsistic delirium of omnipotence. His power exceeds total surveillance. It is total creation, hence utter dominion over all that can be created and perceived. The act of nomination is not innocent. Bastian’s bestowal of names on things and beings grants them ontological existence. This is an intriguing image for power. Not only does it entail the godlike power to create life, but also the power to transcend time due to the strange laws of the world of Fantastica where things spring into being; and simultaneously, have existed since the beginning of time. Ende, Michael. 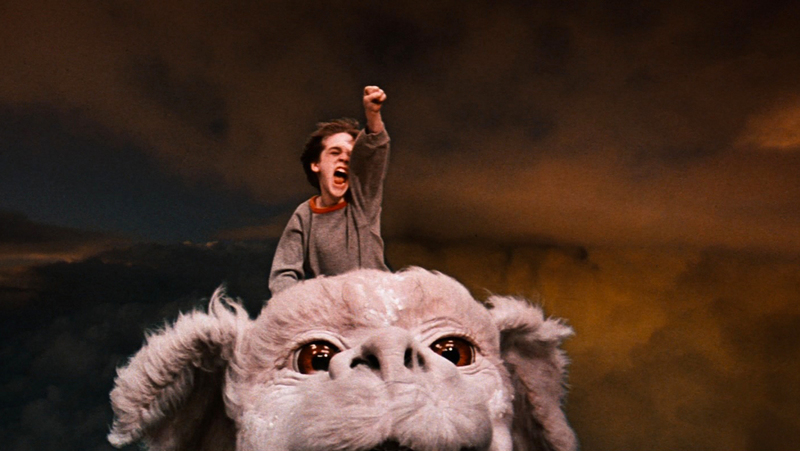 The Neverending Story. Translated by Raph Manheim. New York: Penguin, 1983. Genette, Gérard, Figures III, Paris, Editions du Seuil, 1999. 2. ↑ For the notion of metadiegesis, see Gérard Genette, Figures III, Paris, Editions du Seuil, 1999. Dr. Saul Andreetti is currently an independent researcher of fantasy, myth and comparative literature. He received his Master's Degree and his Ph.D. at the University of Essex. His expertise is, among other things, on the works of German fantasy writer Michael Ende.